April « 2012 « I'd rather be in France. Last month, Steve told me I had a package coming my way: a cocktail tree, which is a single tree that produces different kinds of fruit. 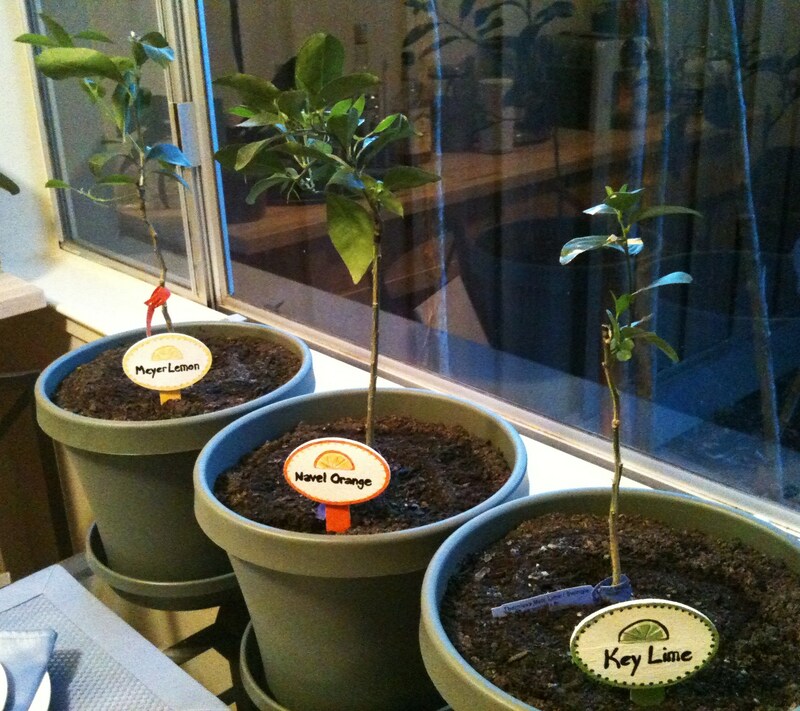 In my case, it was going to be a citrus tree that grew lemons, limes and oranges. Steve’s mom has one in her front yard that I have been coveting ever since we visited her last December. The trees arrived, but I was surprised to find not one but three tiny trees, each labeled as a different, single citrus species. I dutifully researched the best way to care for my new plants. I gave them plenty of time to adapt to their new environment before repotting them in two-gallon pots of cactus and palm soil. 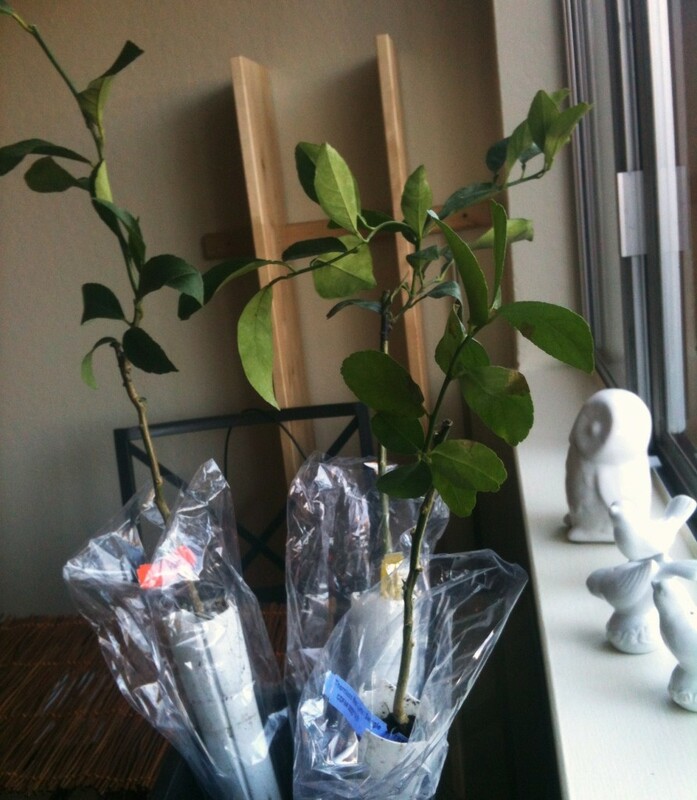 I even splurged on the $8 citrus plant fertilizer that the guy at Home Depot said I probably didn’t need. I fretted over how much water to give them and how often, and when I determined from the color and droop of the leaves that my little trees were depressed from insufficient sunlight from my north-facing windows, I researched plant light bulbs and started giving them supplemental artificial light. The leaves perked up and turned a bright shade of green, but weeks later the “trees” still more closely resembled twigs and only had the leaves they arrived with (or fewer, since I removed some that were damaged during shipping). Then one day I noticed with great delight a tiny light green bump on the stalk of the naval orange plant. I stopped and inspected it every time I walked through the kitchen that day. Something was finally happening! The next day, the bump had turned into three small, distinct leaves. The day after that, the leaves were suspended by a slender green stem, and the day after that, the leaves had reached full size and more tiny leaves were emerging. The Meyer lemon tree was also experiencing a transformation. At the center of each cluster of dark green leaves were little neon green fingers that quickly turned into branches. A week later, even the key lime tree showed its first sign of productivity when small leaves appeared at both the base of the branches and at the very top. Now, the new stems and branches are growing so fast that I have had to cut them back to encourage thicker, fuller foliage. One day these little guys will bear full-sized fruit! My experience moving here was pretty much the same thing. Steve and I arrived in fury of excitement. New city, new ocean, new apartment, new life. We scrambled to get the basic necessities set up in the apartment, and then he went back to his ship and I dove into a job search. I spent hours every day revising my resume and replying to job posts. I visited stores and cafes and handed out my resume. I subtly or not-so-subtly told everyone I met that I was looking for a job in hopes that they might know someone who was hiring. By this time I had been living here a month and unemployed for two. The fear of draining my meager nest egg that was earmarked for my nonexistent business grew, as did the uncomfortable thought that this was all a huge mistake. I expanded my job search — which had been focused on the food and beverage industry — to include everything from paralegal gigs to hotel reception. I registered with a temp agency and obsessively checked Craigslist and Indeed.com. I also spent more than one evening crying over the phone with Steve, who remained supportive and reassuring. Then one day I got an email from a legal support start up company asking me to come in for an interview. A few days after that I was offered the job, which paid considerably more than any of the food jobs I was hoping to get. Best of all, this new job came with total flexibility. I work 30 hours a week whenever and wherever I want. The “office” is located on a small farm about a 10-minute drive from my apartment. I share it with two other people and a dog named Kaya. So far my work days have been filled with the sounds of chickens clucking, Kaya barking, and my coworkers singing along to the soundtrack from The Book of Mormon. A week and a half into my new job, I got a call from a chic restaurant in Santa Cruz where Steve and I ate during our visit back in October. It is owned by a nearby vineyard and winery and focuses on locally-sourced ingredients. We were so impressed by this restaurant — the menu, the food, the wine, the staff, the decor — that it was one of the first places we visited when we returned, and it has remained at the top of my list of food and drink establishments where I would like to work. The manager who called said he had seen my resume come across his desk a couple of times and wanted to meet me. I remember his Craigslist ad was unusual in that it said it was looking for people not with experience but with an inherent sense of hospitality and a love for serving others. I replied with a long email about growing up in Charleston, South Carolina where hospitality runs in the water (or is it the sweet tea?) and about my love for throwing parties and entertaining friends. I also said I couldn’t emphasize enough how much I LOVE (in all caps) good food and wine. I went in for a meeting the next day and had a great conversation about food and local ingredients. At the end of the “interview”, the manager told me he thought I seemed like I presented myself well in front of people and had good eye contact and a great smile. And he wanted me to join his team. On my first night of work as the host of this wonderful restaurant, the manager explained his philosophy of the role and of the “temporary relationships” built during the course of the evening. In many ways it sounds more like a maître d’ than a typical restaurant host. So now I have two jobs: one that exercises the analytical side of my brain in a calm, country, quirky environment and one that exercises my customer service and hospitality skills and that hopefully will give me more insight into the inner workings of a successful, well thought out restaurant. I also finally have a place to reuse some of my chic New York lawyer clothes. A month ago when I was crying over my seemingly hopeless job search, I knew deep down that things were going to work out in some magical way that I couldn’t imagine. Still, my human brain couldn’t help but be overwhelmed with doubt, anxiety, and fear. It is unfortunate because even being unemployed comes with its own very unique benefits. I had ample time to unpack and organize the apartment and explore the area. I had more time to spend with my mom when she visited. I only wish I could have enjoyed those things without the pervasive and sometimes paralyzing anxiety. I guess the best I can do is add this to the archives of Things Just Working Out and maybe worry a little less the next time I am uncertain about the future.